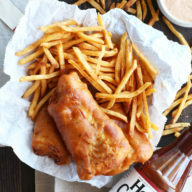 BBQ Beer Battered Fish and Chips take the classic fish ‘n chips recipe to whole new heights of flavor! 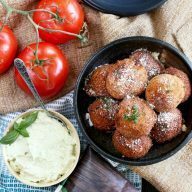 With BBQ seasoning in the beer batter and a BBQ tartar sauce on the side, this festive spread won’t last long once it hits the table. This is the first Friday in a long time that I am SO FREAKING HAPPY THAT IT’S FRIDAY. Yes, all caps are necessary there. I don’t know about you all, but this week has been a major struggle to get through. It could be daylight savings time. It could be the on boarding of new clients. It could be the fact that I just want to go back to Japan for all the ramen. Dramatic much, Meghan? How about we get to the food here? This golden brown, crispy, fried deliciousness is exactly what you need to pair with your beers tonight. With St. Patrick’s Day being tomorrow, I drew some inspiration from the massive amount of fish and chips I inhaled while in Irish pubs in Dublin a handful of years back. Instead of just giving you a straight up recipe, I added some magic to shake things up. 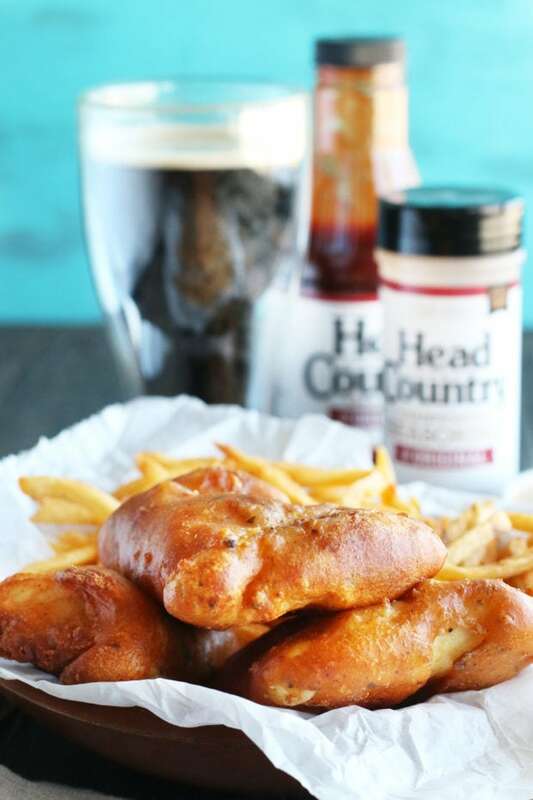 This magic comes in the form of beer and Head Country Bar-B-Q spices! See that golden brown goodness covering the flaky cod? 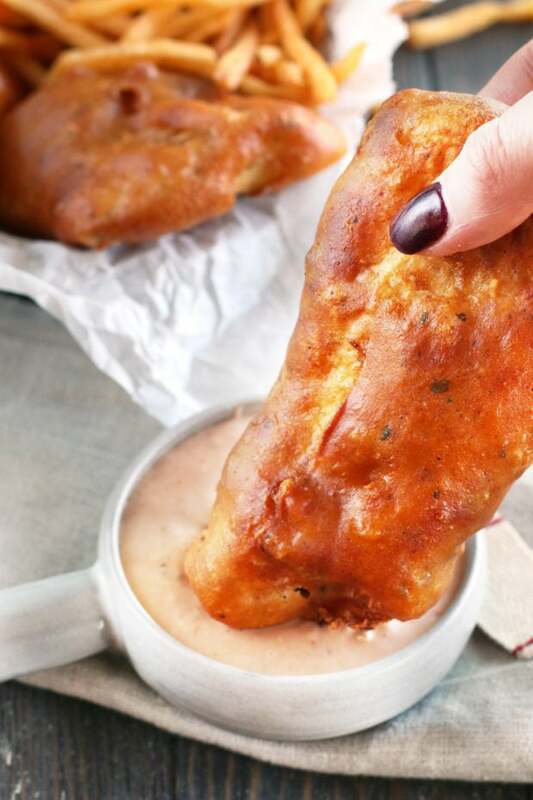 That flavorful batter is packed with beer and Head Country Original Championship Seasoning for a burst of flavor that gives you some smoke and some spice in every crispy bite. 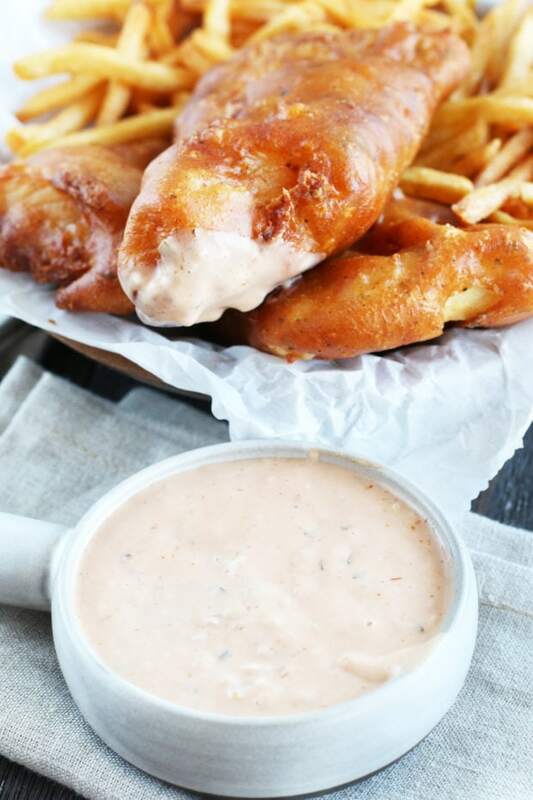 I paired this fish with a quick BBQ tartar sauce, featuring the Head Country Original BBQ Sauce, which adds subtle sweetness to the tart sauce! Then you sprinkle more of that tasty seasoning on the fries (don’t yell at me for my shoestring fries and the fact that they are thick “chips” – this is how I like ’em!). Voila! 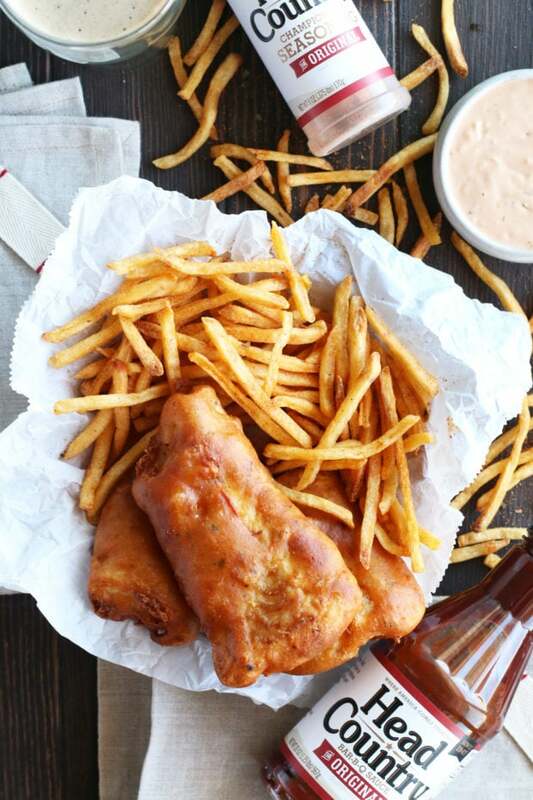 An epic spread of BBQ deliciousness in the form of fish ‘n chips. Get down on the goodness and cheers to a festive weekend of celebration! includes the seasoning and sauce I used in this recipe, PLUS their Sweet & Spicy and High Plains Heat seasoning which are BOMB. 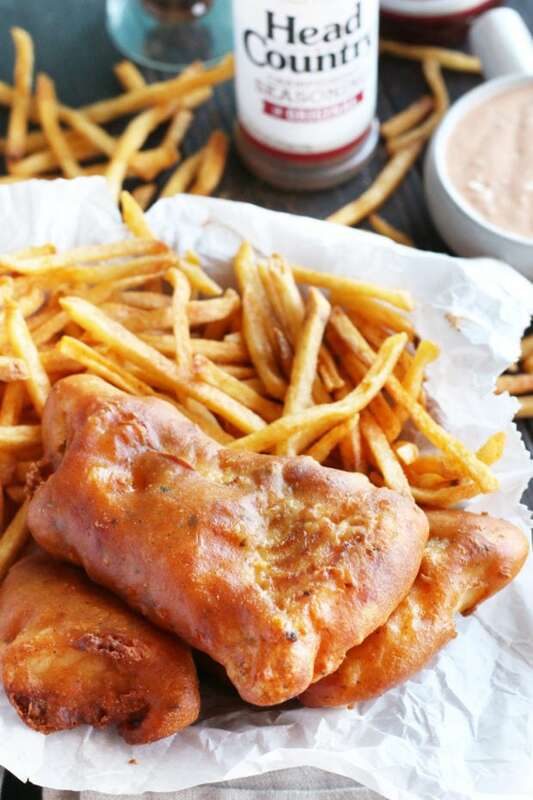 Pin this BBQ Beer Battered Fish and Chips recipe for later! 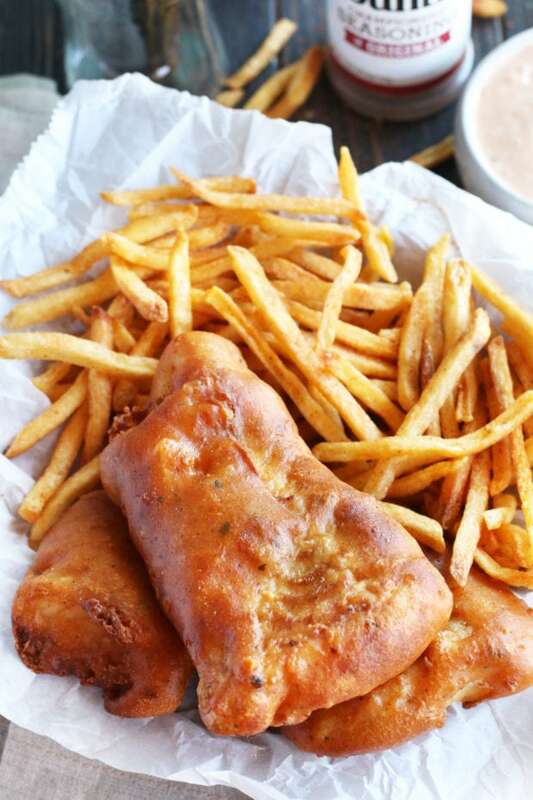 BBQ seasoning and beer make the batter for this fried fish golden brown and exceptionally flavorful! 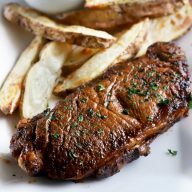 Served with fries and a BBQ tartar sauce, this is a BBQ twist on a classic you know and love. For the fries: Place the cut potatoes in a large bowl and cover with cold water. Refrigerate for about 1 hour. Pour enough oil into a dutch oven to be 3" deep. Heat over medium heat until the temperature reaches 325 degrees. Drain potatoes and dry completely with paper towels. Fry the potatoes, working in small batches, until tender and just crisp. Remove to a paper towel lined plate to drain. Cool for 20 minutes. Increase heat to medium-high and allow oil to heat to reach 375 degrees. Fry potatoes in the same small batches, until golden brown, approximately 2 minutes. Remove to fresh paper towel lined plate to drain. When all the fries have been fried, add them to a large bowl. Toss with Head Country BBQ Original Seasoning. Set aside. For the fish: Mix the ½ cup flour, 1 tsp salt, 1 tsp black pepper, and 1 Tbsp Head Country BBQ Original Seasoning in a shallow bowl. Set aside. 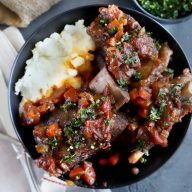 In a separate wide-mouthed bowl, whisk together remaining 1 cup flour, 2 tsp salt, and 1 1/2 Tbsp Head Country BBQ Original Seasoning. Slowly add beer, whisking continuously, until combined. The batter should be the consistency of thick heavy cream. If it is thick, add water as needed to thin out. Dredge fish in the flour mixture, shaking off the excess, followed by dipping into the beer batter. Drain off excess batter. Work in batches to fry the fish. Cook until golden brown, approximately 5 to 7 minutes. Remove fish pieces to paper towel-lined baking sheets. For the BBQ tartar sauce: Whisk together tartar sauce and BBQ sauce. 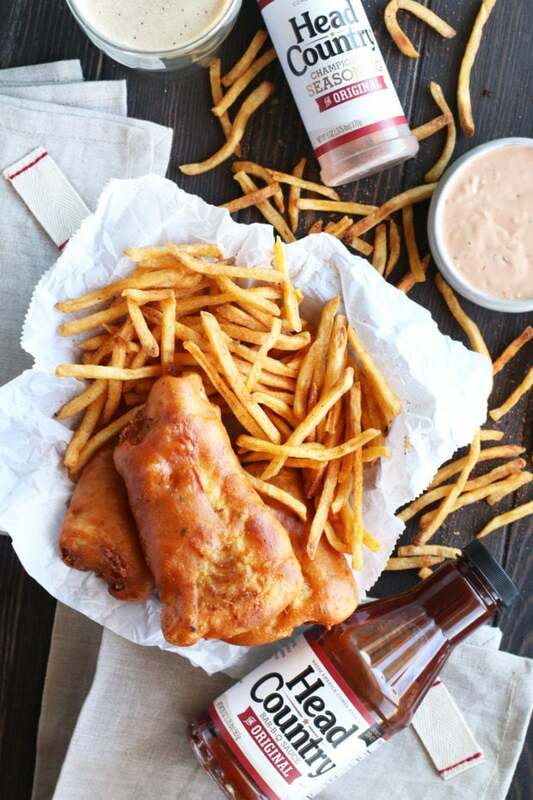 Serve fish and fries warm with the BBQ tartar sauce.